Optoma UHD50 4K UHD Home Theater Projector. Brand New in Box. Factory Sealed. Mitsubishi ES100U DLP Projector. ⦁ HD Video Mode: 1080i. ⦁ Display Type: DLP. Audio may not be supported. ⦁ Projector Weight: 6.5 lb. Lamp and filter are cleaned to improve image quality and extend projector life. Display Technology: 5.0" LCD, by LED Lamp Life 20,000 hours on average; Image Size 50"-100" diagonal; 2 built-in speakers; Aspect Ratio 4:3 Throw Distance 8 feet - 16.9 feet (2.45m- 5.15m); The distance from the projector to the screen is in proportion to the size of the image. Model: P700. Manufacturer: Crosstour. Resolution: 1080p. Projection Size: 32"-176". Display Native Resolution: 800 x 480. Type: LED. Color: White. Provide our staff with. Fit for playing videos, TV series, photos sharing, football matches etc. 【SUPERIOR WATCHING EXPERIENCE】 2019 upgraded LED lighting provides 60% brightness than ordinary projector. 【Easy Setup for Everyone】 Plug & Play. Panasonic PT-AE7000 Projector Highlights. This projector is in very good condition with 1062 hours on the bulb. I bought this new and have used it for a couple years but I have moved and I have no place to use it anymore. This has been tested and working. This item has been powered on, and is in working condition. Item is in great physical condition, with minimal wear and tear from prior use. Both projectors listed have over 1000 hours, but remain in great condition. 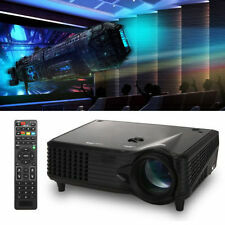 NEW RCA LED Home Theater Projector 1080p 2200 Lumens Shipped FREE. Pre-owned, in good condition. Fully tested and works perfectly. Does not include a remote. Cosmetic dirt, discoloration, from prior use. Lens is dirty and has scuffs from prior use. Includes power cable. Does not include instructions. Does not include software. Does not include mounting hardware. This has been tested via the VGA port and it is in good working order. The front casing has scuffs/scratches. Unless otherwise stated, this has been tested for key functionality. Experience incredible cinematic adventures with 2D and 3D, Full HD 1080p performance. Get deep black levels with a contrast ratio up to 600,000:1. Plus, two pairs of RF 3D glasses are included, so you’re always ready for exciting 3D experiences. Support input Resolution 1080p. Input Resolution 1080p. 1 x UC18 1080P Projector. 1 x AV Cable. Patent dial-type focusing lens. Abandoned the original rough way of fwisting the lens to be focused. PYLE HOME® PRJD907 WIDESCREEN 1080P DIGITAL MULTIMEDIA LED PROJECTOR. Condition is Used.THIS Projector is awesome ! Great for movie nights. Great quality. Condition is Used. Other great features includes the new A/V Mute slide, which enables you to pause presentations in an instant. Lightweight and compact projector weighing just 1.6kg and includes carrying case. Brilliant image quality requires high color brightness. It has 1281 hours on its current lamp. Works great. A cool addition to your home or office for a very reasonable price. This is a very clean Toshiba TDP-T9 Data Projector. 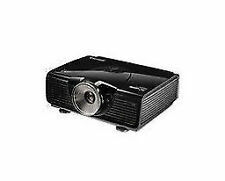 You are purchasing a Dell 4100MP Projector. This has been tested and working. Good used condition. Includes power cable and manual. Light wear from normal use. Has 1010 hours on the lamp. New ListingEpson EX30 LCD Projector H283A w/ Remote Control & Carrying Case. Extra Bulb! Epson EX30 LCD Projector H283A w/ Remote Control & Carrying Case. Extra Bulb!. Condition is Used. Shipped with USPS Priority Mail. Includes various a/v cables as shown. Needs new filter (see pictures), but includes an unopened replacement bulb! 5 out of 5 stars - Epson EX30 LCD Projector H283A w/ Remote Control & Carrying Case. Extra Bulb! 17 product ratings17 product ratings - Epson EX30 LCD Projector H283A w/ Remote Control & Carrying Case. Extra Bulb! Like new only few hours Lamp usage excellent condition like nw. Please feel free contact me if you have any before you buy. Communications have become ingrained in our daily lives. Nothing drives home a sales pitch, lecture, or point of view as well as an excellent visual experience. A 2000 Lumens home theater projector from eBay could assist you with your message, and here are some things to consider. What can you do with these projectors? The 2000 Lumens home theater projector is compact and can be transported to any venue, making it easy to pack it along to make a presentation for clients or set the projector up as a home theater in your backyard. This type of projector is also portable and can be installed for a more permanent situation. You only need to adjust the screen size to fit the needs of your projector location. What kind of picture can you expect from this projector? You can also illuminate pictures from 37 inches up to 150 inches with your best images up to 100 inches. Your 2000 Lumens projector provides the best picture in rooms with low ambient lighting and highly reflective surfaces. How do you connect your other devices? Most of the video projection systems include integrated speakers, eliminating you ever being without sound. These 2000 Lumens home theater projectors also include multiple inputs that include USB, VGA, AV, with some having TF and SD card ports. If you are not fond of the wired experience, some of these projectors allow you to go wireless and connect via Android and iPhone smart devices. How long is the life of these projectors? If you are looking for longevity and low maintenance, you may want to look into LED projection lamps. LED projectors can exceed 20,000 hours of life expectancy. With alternative projection technology, it ranges from 3,000 to 6,000 hours. 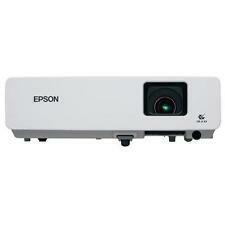 Another benefit to remember is that LED projectors use a fraction of the power that LCD and DLP projectors use. LED projection does not require the cooling that the other projectors do. While this is a desirable feature concerning energy, it also reduces noise from any fan or cooling unit. Since the LED does not require the power or cooling, it also does not require as large as a power supply, reducing weight and often the size of the cabinet that contains the unit.